Our CAMPEP-accredited Program is designed to prepare students for professional careers in the field of Medical Physics. MEDICAL PHYSICS is an applied branch of physics concerned with the application of the concepts and methods of physics to the diagnosis and treatment of human disease. Medical Physicists are concerned with clinical service and consultation, research and development, and teaching. Radiation Therapy Physicists perform acceptance testing and commissioning of new equipment, calibrate radiotherapy units and maintain their clinical information, contribute to the development of therapeutic techniques, design treatment plans, and assure the safe and effective delivery of radiation as prescribed in patient care. Diagnostic Radiology Physicists contribute to the advancement and effectiveness of radiological imaging exams and procedures by helping to develop improved imaging techniques and using them for the diagnosis of disease in patients. Nuclear Medicine Physicists ensure correct and safe application of radioactive molecular-agents used in the diagnosis and treatment of disease, assist in the introduction of new agents including their dosimetry, assess the performance of Nuclear Medicine equipment, and contribute to the development of quality assurance programs. 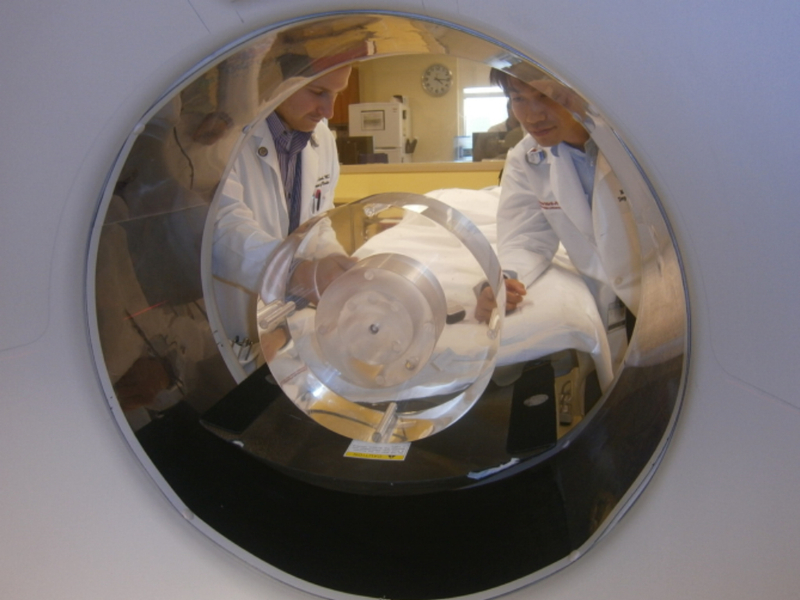 Medical Health Physicists contribute to the protection of patients and the public from excessive radiation by establishing and monitoring radiation safety procedures and ensuring compliance with applicable federal and state regulations. Our 36-point CAMPEP-accredited program educates, trains, and prepares future medical physicists. It is registered with the State of New York, is administered by faculty from the Fu Foundation School of Engineering and Applied Science in collaboration with faculty from the College of Physicians and Surgeons and the Mailman School of Public Health, leads to a Master of Science (M.S.) degree, and provides preparation toward certification by the American Board of Radiology. B.S. degree or B.A. degree in physics, applied physics, or one of the physical sciences, including physics training at least equivalent to a minor, and general GRE exam scores are required. The Physics GRE is recommended. Proficiency at written and spoken English and a working knowledge of computer programming and probability and statistics are also required. The priority deadline for applications for full-time study is February 15. Applications received by June 30 will be considered on a space-available basis. Applicants are asked to inform the Program Coordinator ss4198@columbia.edu following the submission of an online application. As a rule, assistantships, grants, scholarships, and fellowships are not available to students in master's degree programs, including the medical physics program. U.S. citizens and permanent residents may be eligible to receive federal student loans. Please see FAQ #2 for additional information. Opportunities for specialization exist via the choice of elective courses and practicums. In addition, a fourth semester option exists. During the spring term, practicing professionals and faculty in medical physics present weekly seminars. A passing grade on a comprehensive examination is required for graduation. This examination, on subjects covered in the first year of study, is taken in August before the start of the third term of study. Successful completion of two online ethics courses, offered without charge to students enrolled in our Program, is required for graduation.